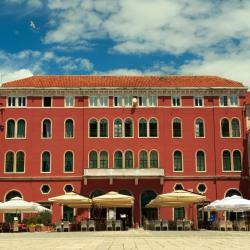 Looking for hotels near Diocletian's Palace? 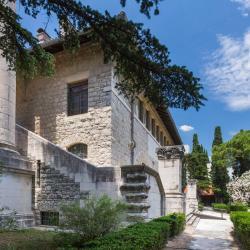 Located in Split, about 2 km from its historic core and the UNESCO-protected Diocletian's Palace, Hotel Ora offers a restaurant, free WiFi and a fitness centre. Everyone was very helpful and friendly. Priska Luxury Rooms is set in Split, 300m from Diocletian's Palace. All rooms boast a flat-screen TV with satellite channels and a private bathroom. Znjan Beach is 5 km from the hotel. Perfect location - nice and quiet, but close to everything. Boasting an outdoor swimming pool on the top floor with panoramic views over Split, Dioklecijan Hotel & Residence offers a wellness centre and a restaurant. The pool and the big rooms with a confortable bed. 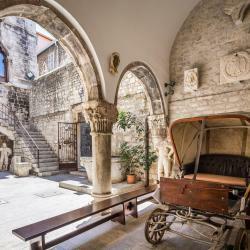 Hotels with great access to Diocletian's Palace! 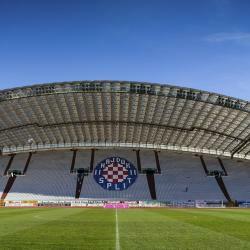 Hotel Cvita in Split has 4-star accommodation with an outdoor swimming pool, a fitness centre and a spa & wellness centre. Among the various facilities are a garden and a terrace. We have travelled aroud the world and have stayed at a lot of nice hotels the last 30 years. Offering a terrace and views of the garden, Heritage Hotel 19 is situated in the Split City Centre district in Split. Guests can enjoy the on-site bar. All rooms are fitted with a flat-screen TV. Coming in Split is already an experience. Divota Apartment Hotel offers air-conditioned studios and rooms on 5 locations in the Veli Varoš District of Split. The studios feature free WiFi, a fully equipped kitchenette and a flat-screen TV. Everything in the room worked well. This is an amazing palace with full ancient history! This is an amazing palace with full ancient history! We really enjoyed looking at the different gates, galleries, temple and museums inside the palace which also has many shops and restaurants. You will not be disappointed because there is so much to see and discover that it will leave you in awe. The basement vaults are impressive. The basement vaults are impressive. Part of it can be accessed for free (where the market stalls are) but you have to pay to access the rest. There's a little bit of the palace still visible above ground (free) but a lot has been lost to subsequent buildings. If doing the vaults it might be better to go on a guided tour. There is occasional multilingual signage for independent visitors but it is limited in extent, badly placed & the font is tiny so hard to read unless you can stand close - harder when it's busy. The streets are paved with stone and can be very slippery, especially after rain, so wear shoes with a decent grip. Allow yourself plenty of time to explore as the streets are many, narrow and can be a little hard to navigate. The effort is worth it as this area is beautiful and has a great atmosphere. Don't stay in this area in September if you are looking for a 'quiet' break as the area is still busy and noisy despite it not being 'high season'. I love it! 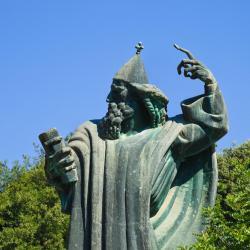 The best of my trip to Croatia.. Dubrovnik is also very nice, but I found it very over rated.. Split is just amazing. If you like Roman culture, the Diocletian palace is a must. The walls, the streets, the mausoleum, etc. Everything is top class of Roman arquitecture. And the whole city has very good vibes everywhere..
Unbelievable example of Roman architecture well worth the entrance fee. Best to visit when there are no big Cruise ships in as it gets very busy, we managed to get in before ships guided tours so was not so bad. Unfortunately the apartment did not have TV or internet, wouldn't have stayed if knew as had no contact with family unless go out. Was a good location but bedroom had sheer curtains and room extremely bright at night. Bath towels only the size of tea towels, too small. People are talking about Diocletian's Palace! Explore guest hotel reviews featuring "Diocletian's Palace"
The beds are incredibly comfortable, the showers nice and warm. 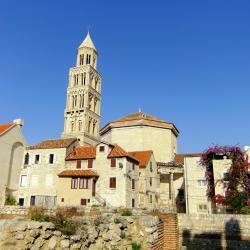 It’s close to Diocletian’s palace and the shopping streets, so the location is great. Boris, the owner, is very nice: I had a late check in but he stayed to make sure I got there in one piece, and when I accidentally left a book there he was happy to post it back to me. This was by far my best hostel experience. 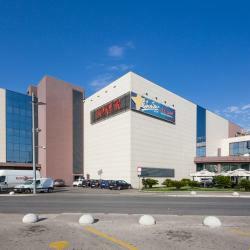 This is apartment has a great location within walking distance of the cruise ships, ferries and Diocletian’s Palace. The host offered to wash our clothes for 10 euro which was great.There is a tiny balcony which has a slight view of the harbour. The hosts are very pleasant people and very helpful. Toni Palace rooms are in the heart of Diocletian’s Palace. Despite the fact that is only moments away from the cathedral the rooms are quiet. The rooms are furnished with comfort in mind and the bathroom well equipped. The breakfast provided excellent. The staff were most welcoming and helpful. The ambience was top form. Luxurious with a fantastic view of the marina waterfront. 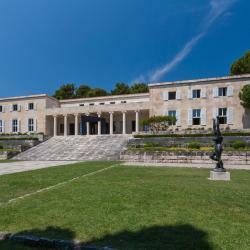 The location was excellent as it was a short walk to Diocletian’s palace in the city centre. The host was warm and welcoming and gave complimentary breakfast vouchers, and tips for getting around the city. 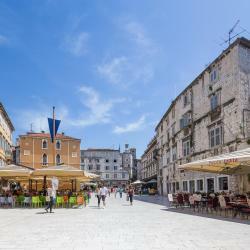 Very convenient location for Split old town, Diocletian’s palace and harbour. Pleasant and welcoming hostess. Very handy to the old city / Diocletian’s Palace. Host was very good to deal with and good value!